„Biking into Beijing will be a piece of cake: first we go west along Interstate 102, then we hit the sixth ring-road and there’ll be a biking lane all the way till Tian’an men square.”- explains Volker. It sounds good enough to me. Nothing could possibly be worse than our exit from Dalian three weeks ago, which we managed to survive unscathed, except for shattered nerves. Tian’an men square seems to be around the corner now, when we are merely 160 km away, in the county town of Zunhua. Here, in immediate vicinity of the Chinese capital, life still maintains human dimensions. No more economic development zones, no eight-lane empty roads, no brand-new outskirts with high-rises yet to be inhabited. The streets are flanked with three-storied buildings weathered by the elements, their ground floors containing the typical hodgepodge of restaurants, corner stores and workshops. Sarah and Nora are impatient to be back on the road and to reach Beijing. For Beijing means to them one thing – shopping spree. All these unattainable treasures they were seeing along the way – squeaking plastic chickens, barking violet dogs,- for which there was neither place in the luggage, nor parental will, could soon be theirs. Well, in addition Sarah would like to see the palace of the Chinese emperor, while Nora is curious about the public toilets in the Forbidden City. The gales that were sweeping the northern Chinese coast do not reach here, the sky is blue and the terrain is reasonably flat. It seems the last two days of biking will be truly enjoyable. They would have been, if it wasn’t for the trucks. We are barely at the outskirts of town as the first truck roars past us. And then a second one, and a third one…And splash! Something wet lands on my hands. The trucks are overloaded with sand that had been soaked with water to prevent its scattering during the transport. The dirty water streams down onto the road, and each overtaking truck covers us in muddy splashes. The impact is soon visible. “They can’t be transporting the sand too far; this should be a local affair, some construction site close-by,” – I motivate myself. On the strike of 12.00 the street empties – the truck drivers retreat for a lunch break. We have skipped breakfast this morning, planning for a noodle brunch somewhere on the way. But now we decide to use the respite from heavy traffic and go on biking, despite the hunger. We pass by the Changrui Mountain, the resting place of five emperors and numerous empresses and concubines of the Qing dynasty, whose tombs I visited with the girls the day before. From here till the Tian’anmen Square we will be following the route taken by imperial funeral processions during the last dynasty. The trucks re-appear soon after. As usual, trucks and cars slow down as they spot us for an impromptu photo session, which induces a cacophony of honking from those behind. A truck lines up with our tandem, the co-driver aims time and again his mobile at us, another hurrying truck, its honking being ignored, speeds into the narrow opening between us, almost sweeping us off the road. On a second thought, the broad empty streets in the development zones weren’t so bad. As if the heavy traffic on the narrow road, the sand and dust are not enough, we got ourselves stalked. Two overweight teenager girls on a scooter spot us in the next town, burst in shouts: “Hao ke’ai!” (How cute!) and race behind us, screaming in delight. No matter where we turn, their laughter and screams “Hao ke’ai!” soon re-echo from behind or from left, or from right. 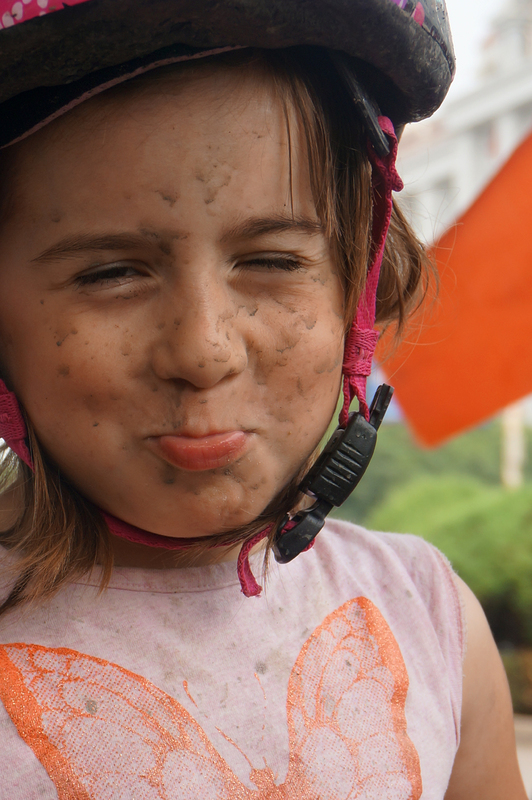 In the late afternoon we reach the town of Sanhe – our overnight stop, – crusted with mud, dust burning in the eyes and sand crunching between our teeth. It is not easy on the next morning to push ourselves for the very last lag. 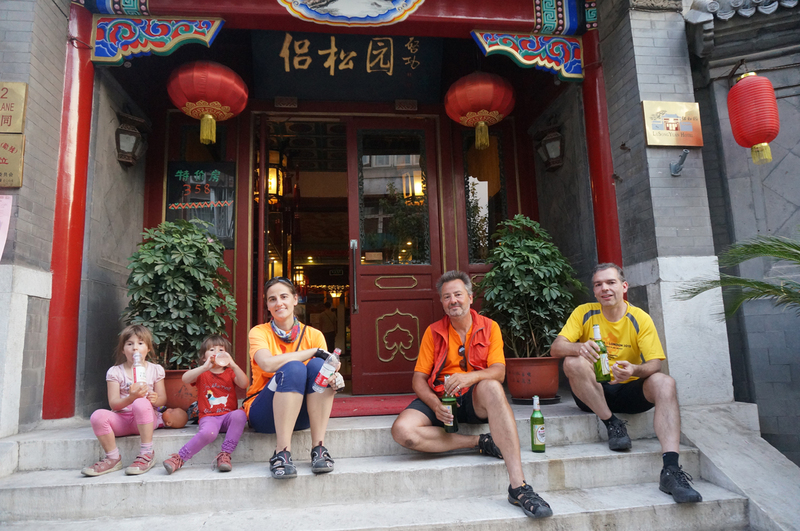 Our Beijing friends – Doro and Manfred,- already left Beijing in the morning to meet us and bike together with us the last kilometres. They might reach Sanhe by the time we depart! From Sanhe onwards the trucks disappear, the road is reasonably broad and we have a real biking lane. A pair of brightly dressed bikers appears. “Doro and Manfred!” I think and wave at them. As they come closer, however, an elderly Chinese couple emerges from behind the face masks and the sunglasses. 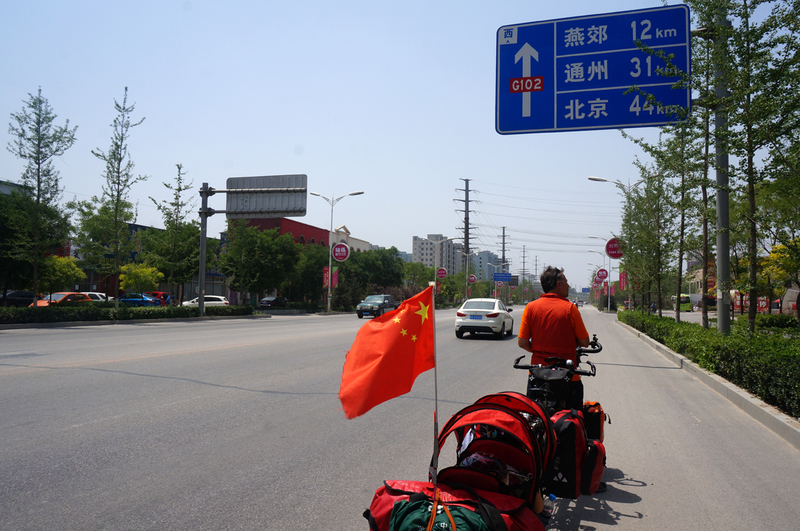 They are biking back to Beijing from the sea resort of Beidahe, 300 km away. The old man breaks out in toothless smiles as he inspects our vehicle from all angles and hears our explanations, his wife admires the leather saddles, we take pictures of each other and then part, to meet time and again further down the road. As we swish down a long bridge a sudden thumping is heard from behind and I see my red biking bag rolling down the street, electronics inside. The clip of the new Vaude bag was repeatedly breaking ever since Shanghai, and now, merely kilometres away from our final destination, it fell completely apart. Volker somehow managed to re-assemble the parts and we reach our welcoming committee, patiently waiting for us after the power station. Really fortunate, for the bag clip breaks again soon after, its parts scattering under the wheels of the cars. The bag goes on the luggage tray of Doro’s bike – and our procession heads towards Beijing. As we roll towards Tian’an men along the endless Avenue of the Eternal Peace I realise that for the very first time I experience Beijing by bike. 22 years ago I tried to learn biking here, in the quiet lanes of the university campus. However, once faced with the traffic chaos on a real Chinese street, I lost courage to ever try again. Until now. Suddenly the last 20 kilometres seem too short – there is so much to catch up with. The Tian’an men square, which two months ago seemed beyond our reach, suddenly spreads out in front of us, To the right, at the entrance to the Imperial City, is the Gate of Heavenly Peace, with the portrait of Mao Zedong hanging there since 65 years. To the left, over the Avenue of the Eternal Peace is the Monument to the People’s Heroes and Mao Zedong’s Mausoleum. As usual, crowds of tourists clutter in front of the Gate, but upon our arrival the cameras turn from Mao’s portrait to the novel sight of Langnasen family on an yet unseen vehicle. The best part of today’s journey comes soon after – the way to our hotel leads through the narrow hutongs (alleys) of the old Beijing residential quarters in the vicinity of the Drum Tower. Our Stammhotel, Lusong yuan, is a traditional courtyard residence, home to a general in late Qing-Dynasty and office to former Chinese president Hu Jintao in the 1980s. It was the first boutique hotel in China und Volker knows the sales manager since he studied one hutong to the north at the Central Drama Academy in 1994/5. And after the Last Ice-cream Stop, there comes the time for the Last Schmutzbier (dirty beer), called so in the China-By-Bike jargon because it is consumed immediately upon arrival, with the luggage still in the lobby and the dirt still sticking to the skin. Sarah and Nora indulge in their last Schmutzlimonade.